I’ve been a fan of Morning Glory Bread ever since I was a little kid. 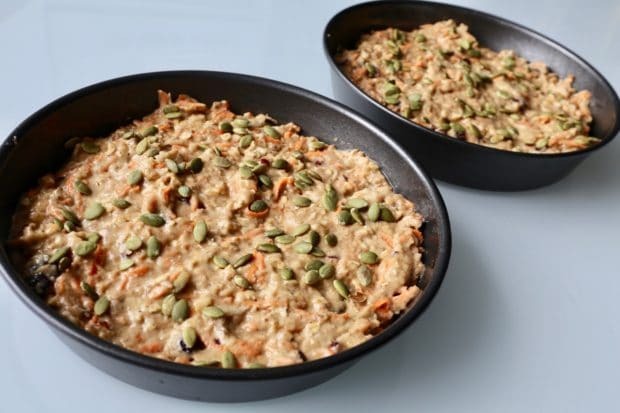 The classic healthy-meets-hearty recipe typically features shredded carrot and apple, dried coconut, raisins, nuts and cinnamon. Morning Glory Bread ready to pop in the oven. In an attempt to make my favourite Morning Glory recipe even more healthy I got busy in the kitchen, tinkering to cut the fat and sugar in half, while adding additional crunch and munch. My newly imagined recipe tastes better than ever with the addition of milk and yogurt soaked oats, flax, dried cranberries and apricots, and pumpkin seeds. Cut yourself a thick slice and slather with room temperature cream cheese or butter for a truly sublime morning meal. Freshly baked healthy Morning Glory Bread. 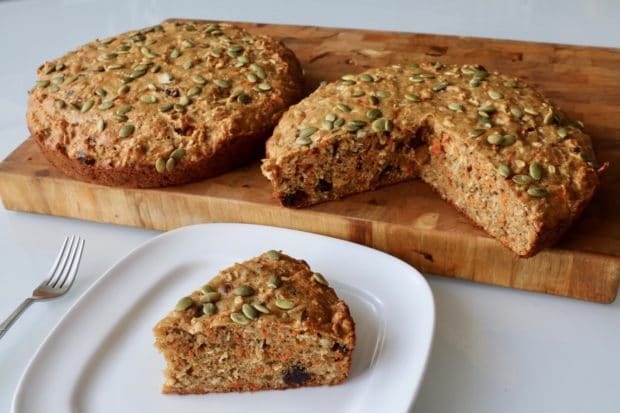 Our healthy Morning Glory Bread recipe is packed full of fiber and fruit. It's the perfect breakkast or compliment to tea time. In a large bowl mix together flour, flax, sugar, baking soda, cinnamon, and salt. Stir in carrot, dried fruit, nuts, coconut, grated ginger and apple. In a medium bowl soak oatmeal in yogurt, milk, beaten eggs, oil and vanilla. Stir into flour mixture until batter is just combined. 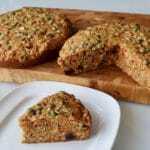 Pour batter into two well-greased cake pans and sprinkle with pumpkin seeds.